Guys need to gather every once in a while. My wife and I have an arrangement that, on occasion, she can have an all girls’ night out and I can have an all guys’ night out -- just to escape reality, which sometimes is necessary when you have a 3-year-old. A 3-year-old can create a lot of work for his or her parents on a daily basis. My turn for a night out came when it was much needed. I called up some friends of mine and asked if they wanted to go out. Wanting to take a break from their family life as well, two of my friends eagerly took up the offer. We decided to go bowling. My bowling buddies for the night included Buttons and Seeds. Guys -- especially guys of Italian descent -- never keep their actual names. That’s an unspoken rule. Buttons got his name because he can’t go five minutes without text messaging someone on his cell phone. His fingers hitting the buttons sound like Morse code in fast motion. Seeds got his name because he eats more sunflower seeds in a night than the entire membership of Major League Baseball does during two seasons. My friends named me No Weight because they believe a few party balloons filled with helium could lift my scrawny body into the sky. Our night of bowling began with the lowest bowling scores any of us had ever achieved. Not that any of us were very skilled bowlers, but we were in extremely poor form on this particular evening. Of my pitiful performance, I said, “If we were playing golf, I’d be the winner of this game since I have the lowest score.” That’s when I got the idea for Bolf. Bolf is basically Bowling meets Golf. The object of Bolf is to have the lowest possible score at the end of the game, just like in golf. 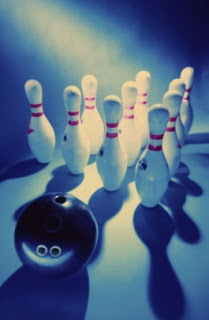 Each time you roll the bowling ball down the lane, you must hit at least one pin. If you don’t hit a pin, it’s the same as getting a strike -- it’s like knocking down all the pins. So if you throw gutter balls all night -- or strikes for that matter -- then your score will be awfully high and you’ll most likely lose the game. If you knock down one pin each time you roll, your score will be very low and you’ll most likely win the game. Bolf isn’t the first game my friends and I have invented. During every “guys’ night out,” there are phone calls from the wives. My friends and I turned the phenomenon into a competition to see who can get the least Number Of Wife Calls in an evening. Seeds began the NOWCa (pronounced now-ka) game that night at the bowling alley when he got a call from his wife. Like the “real men” that we are, Buttons and I gave Seeds a bad time, even though Buttons used the break in the game to text message his significant other so she wouldn’t call him and run up his NOWCa score. Just as I busted Buttons for text messaging his wife, I got a cell phone call from my wife. That type of slam stopped bothering me a long time ago. I won’t act macho in front of my wife just to please my friends. I have to live with my wife. Needless to say, I left the bowling alley that night having garnered the highest NOWCa score of the evening. I had also played several terrible games of Bolf, and made myself sick to my stomach after eating sunflower seeds, helping Seeds fill three trashcans with chewed up sunflower seed shells. Phrased another way, I went home to a happy wife, having happily answered her calls. I also rolled the most strikes of my life and I think I gained five pounds from all the sunflower seeds I ate.